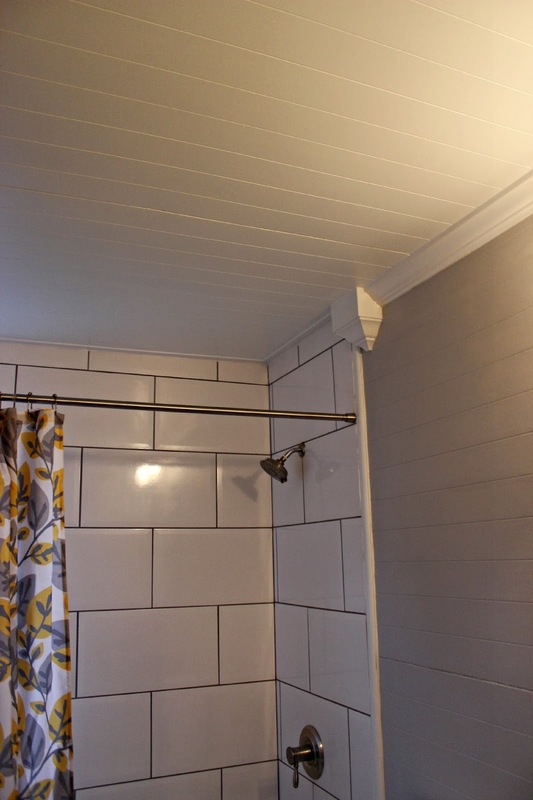 Brandi Nell the Southern Belle: Guest Bath Transformation! I hope y'all are having a good weekend. We are having another cold night here in Atlanta. 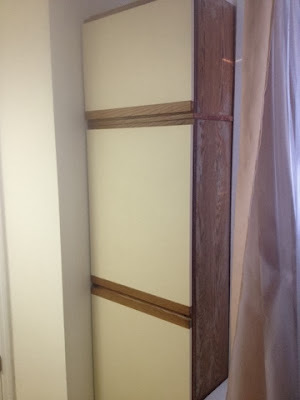 Hubs is upstairs working on transforming our loft into a third bedroom. I'll be sharing that project with you guys soon. 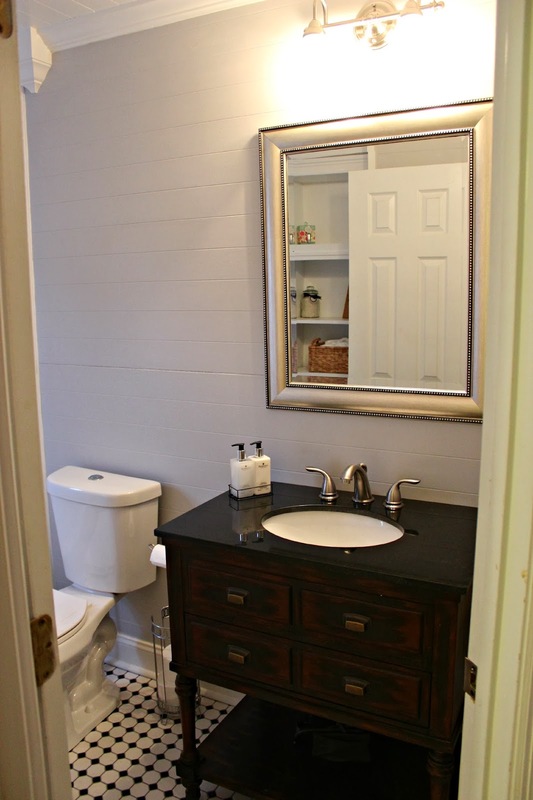 We have finished the Ugliest Bathroom in America. Let me remind you of all it's 1980s glory. 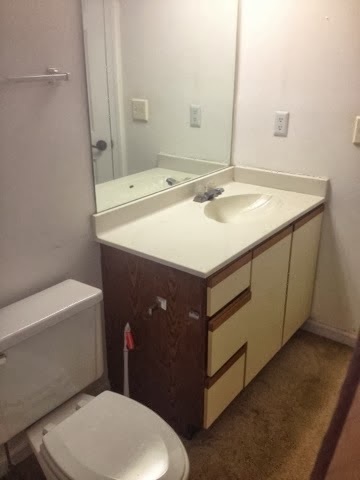 If the carpet isn't appealing to you, perhaps you enjoy the seashell shaped sink. Or the hospital-esque cabinetry? How do you like that behemoth of a toilet? Or the builder grade mirror? Not pictured here is the fluorescent lighting soffit. Oh yea, this bathroom was a total gem. Thankfully, I have a hubs who is hardworking and extremely talented in the home renovation department. 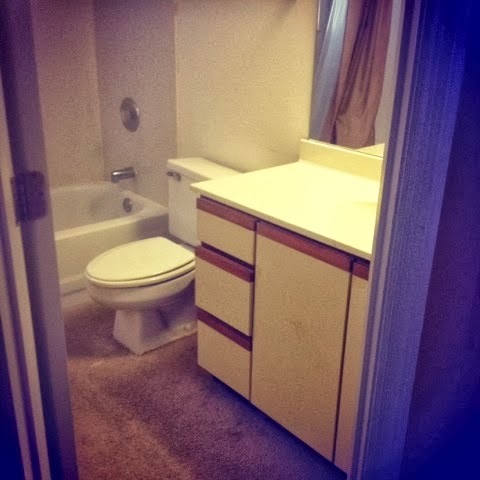 The Ugliest Bathroom in America no longer exists. It has transformed into one of my favorite rooms in our home. 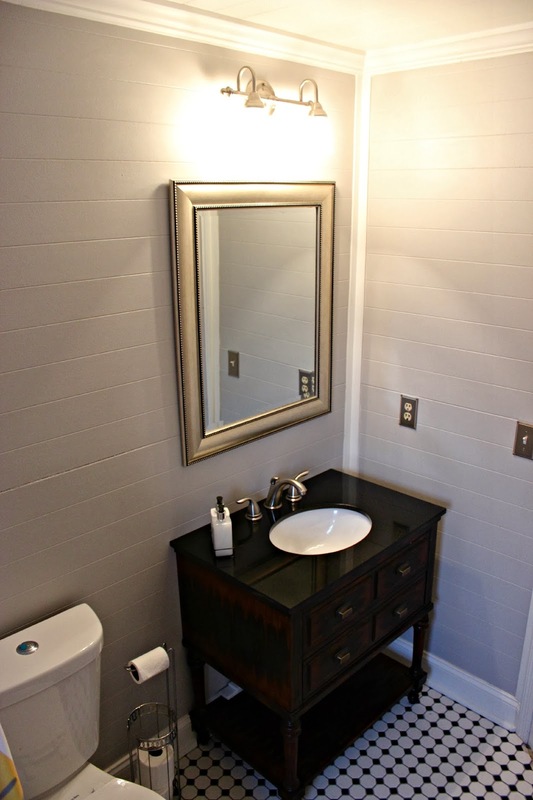 We installed new tile flooring and a new toilet. 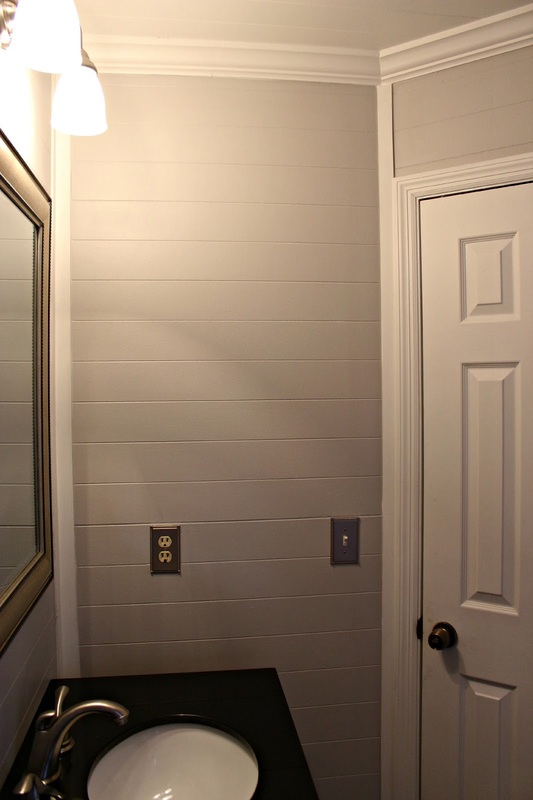 We added paneling and trim to the walls and the ceiling. We also added new lighting. 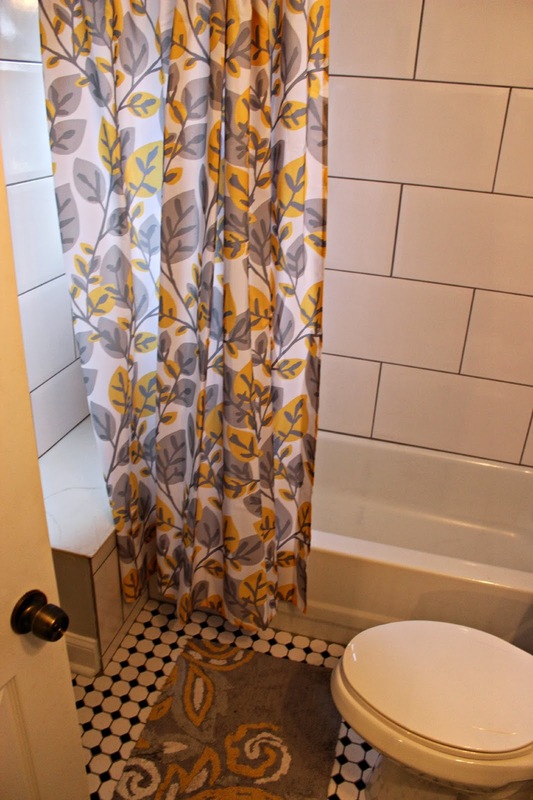 We added new shower tile and shower faucet kit. 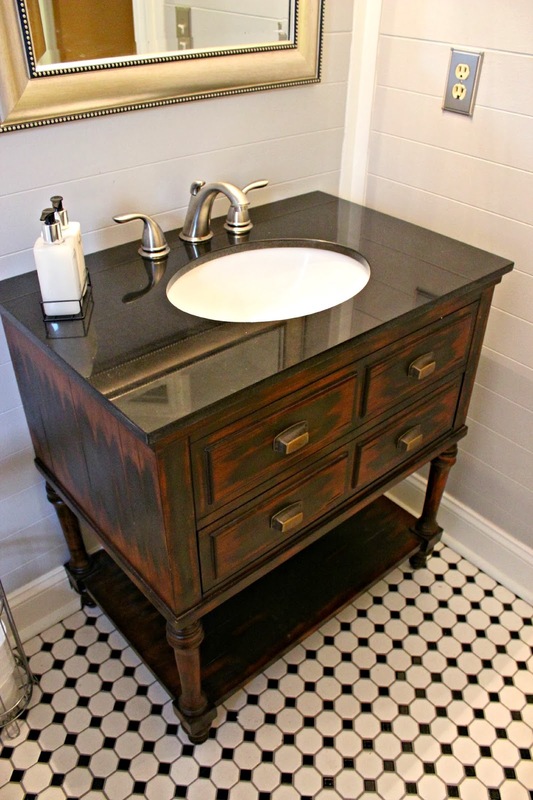 We purchased the vanity from a wholesaler. 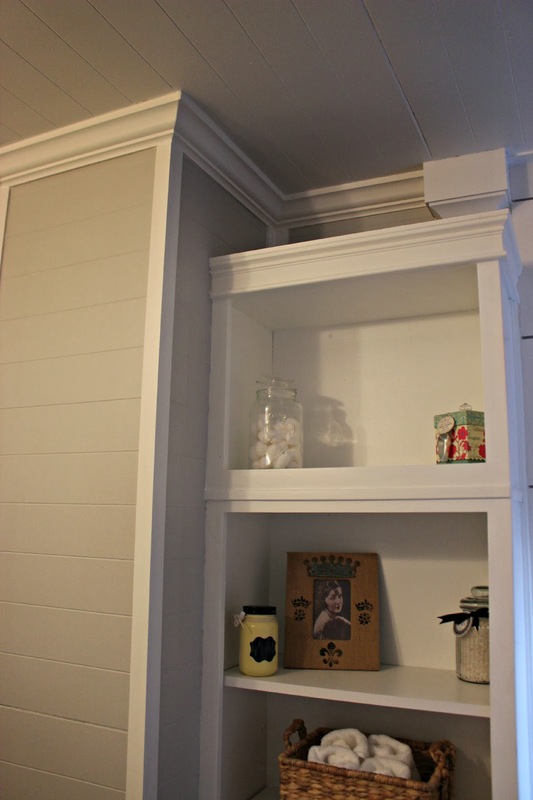 We rehabbed the tall cabinet (see below). CLICK HERE TO SEE PREVIOUS POSTS. Finally, I got to finish it off with accessories. 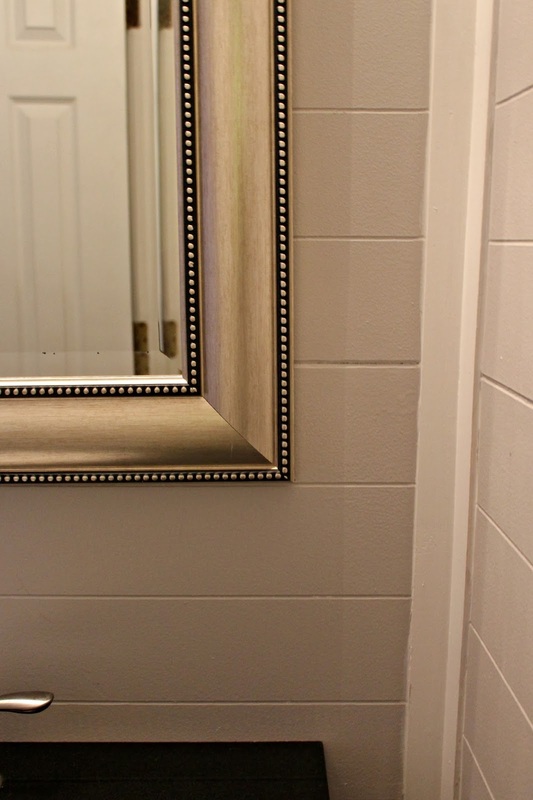 I picked up this mirror at a local Garden Ridge store. 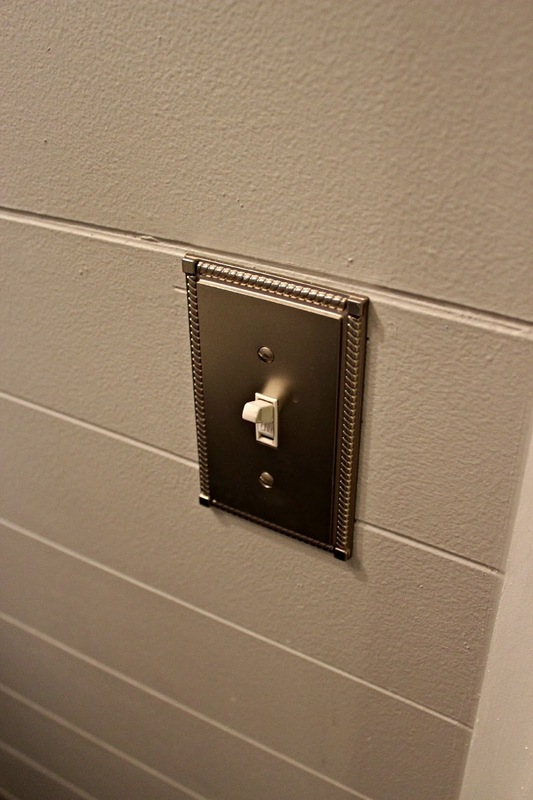 The electrical switch plates also got an upgrade. I found the shower curtain and rug at Target... of course. I'm not sure if I ever showed you guys the large 1980s melamine cabinet. This thing was hideous. We knew we wanted some additional storage besides the vanity, so hubs and I priced out a new cabinet to take it's place. They were a bit out of our price range at $300-$350 UNFINISHED. We came up with a better solution. 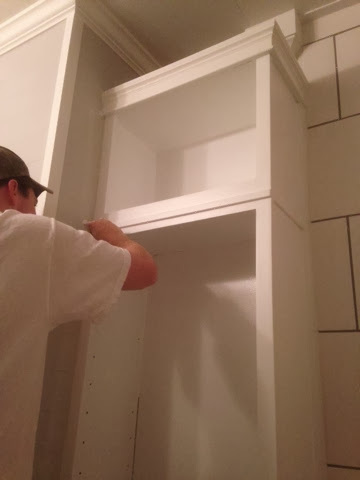 We took the doors off the old cabinet, cleaned it up, painted it, and added trim. I AM IN LOVE. Who knew that ugly thing could become THIS? 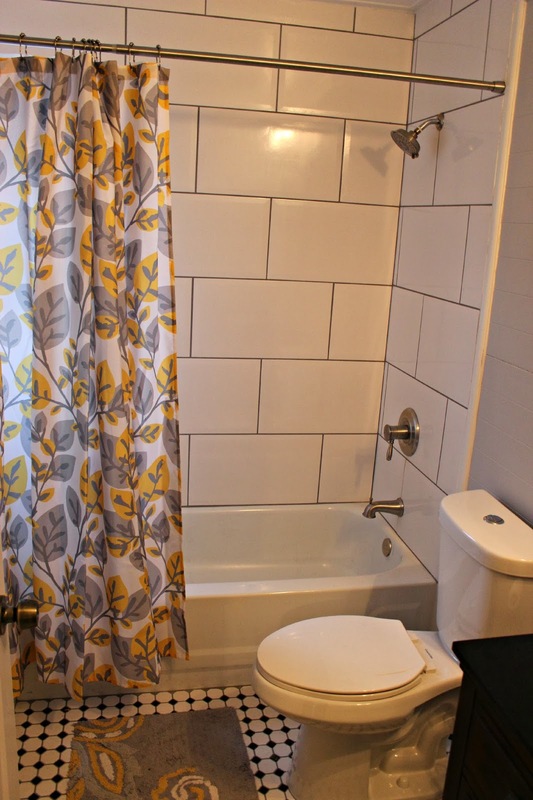 The Ugliest Bathroom in America is now a charming, classic bathroom that I am not ashamed for our guests to use. Do you have a big project you are thinking of tackling? I'd love to hear about it. We are looking forward to sharing another big project with you soon: the conversion of our loft into a second guest bedroom! Hope you enjoy the rest of your weekend. Talk soon, friends! 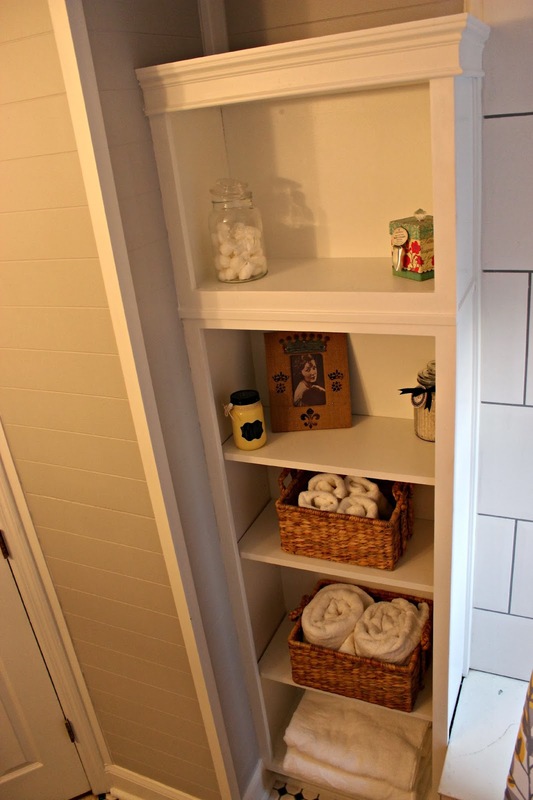 You have the cutest blog and the bathroom is ahhh-mazing!! Love it! Love love love! Now for a bathroom warming party! I'll bring pretty candles! I love your new bath. You and kev are amazing !!!! So proud of both of you. I love the new bath. Hey, love this! Can I ask the brand name of your vanity? I am looking for something similar.